Brachial plexus palsy is a birth injury that causes a weakness or loss of movement in a child’s arm, hand, fingers, and/or shoulder. The injury is caused when the bundle of nerves near the clavicle or shoulder, called the brachial plexus, are damaged during childbirth. One type of brachial plexus palsy, known as Erb’s palsy, affects only the upper nerves of the brachial plexus. Global or total brachial plexus birth palsy, on the other hand, affects both the upper and lower nerves. Different types of brachial plexus palsy injuries can also be distinguished by the amount of paralysis in a child’s arm. Brachial plexus palsy injuries may be sustained at childbirth as a result of the negligence of obstetricians during the mother’s pregnancy or of medical professionals assisting in the child’s birth. Birth injury and brachial plexus palsy attorney Jeff Killino has acquired considerable expertise with a wide variety of birth injury cases, including those involving brachial plexus palsy birth injuries. If your child has sustained a brachial plexus palsy birth injury and you believe that your child’s injury may have been caused by medical malpractice or negligence during your pregnancy or the delivery of your child, you may be entitled to compensation for the damages your child has suffered as a result. Contact brachial plexus palsy attorney Jeff Killino at 877-412-8490 for a no-cost assessment of your case and further information regarding your legal options. Medical negligence or malpractice leading to a child’s brachial plexus palsy birth injury may occur during the care of the mother during her pregnancy or during the labor and delivery stages of the birth of her child. Obstetricians or other physicians who treat and care for a woman during her pregnancy, as well as nurses and other medical personnel who assist in that care or treatment, have two patients, the woman and her fetus. These medical professionals have the duty to exercise reasonable care for the safety of both the mother and her fetus during her pregnancy and may be held liable for injuries or death to the fetus caused by a failure to exercise the required level and quality of care. Medical negligence causal of a child’s subsequent brachial plexus palsy birth injury may occur in several ways during the mother’s pregnancy. For example, a physician’s failure to monitor and manage a pregnant woman’s weight gain or diabetes may result in fetal macrosomia, or a fetus of a weight that is above average for its gestational age. Fetal macrosomia may, in turn, lead to a childbirth complication known as shoulder dystocia, which occurs when a fetus’s shoulder is caught behind the mother’s pelvic bone as the fetus moves down through the birth canal. 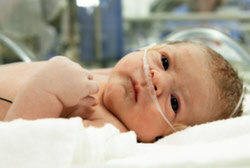 Shoulder dystocia is far more likely to occur with fetuses over a certain size and weight and often results in brachial plexus palsy injuries when obstetricians or others assisting in a child’s birth pull on or stretch a baby’s neck or head in an attempt to get the baby’s shoulder free of the mother’s pelvic bone. Brachial plexus palsy injuries may also occur as a result of medical malpractice during the labor and delivery stages of a child’s birth, even in the absence of medical negligence during a mother’s pregnancy. If, for example, a woman’s weight gain and/or diabetes are managed appropriately during the woman’s pregnancy, but nevertheless result in a fetus of a weight or size too large to safely pass through the mother’s birth canal, the failure of the physician assisting in the child’s birth to order a Caesarian section when a vaginal delivery is determined to pose significant risks to the baby’s safety may be found to constitute medical negligence on the part of the physician. The physician may, thus, be found liable in a medical malpractice action for a brachial plexus palsy injury sustained by the child during the child’s vaginal delivery. Brachial plexus palsy birth injuries may also be caused by medical negligence during labor and delivery through the mismanagement of complications other than shoulder dystocia. For example, brachial plexus palsy birth injuries have been caused by the putting of excessive pressure on a baby’s arms when the baby has presented in a breech position. The improper use of forceps to assist in a difficult delivery may also result in a baby’s brachial plexus palsy birth injury. If your child sustained any type of brachial plexus palsy injury during childbirth and you suspect that your child’s injury may have been caused by medical negligence, brachial plexus palsy attorney Jeff Killino will fight for the compensation to which you and your child are entitled. 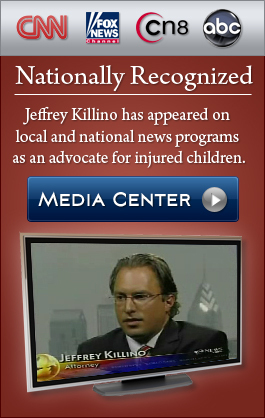 Contact child birth injury attorney Jeffrey Killino at 877-412-8490 for expert assistance with your child’s case.